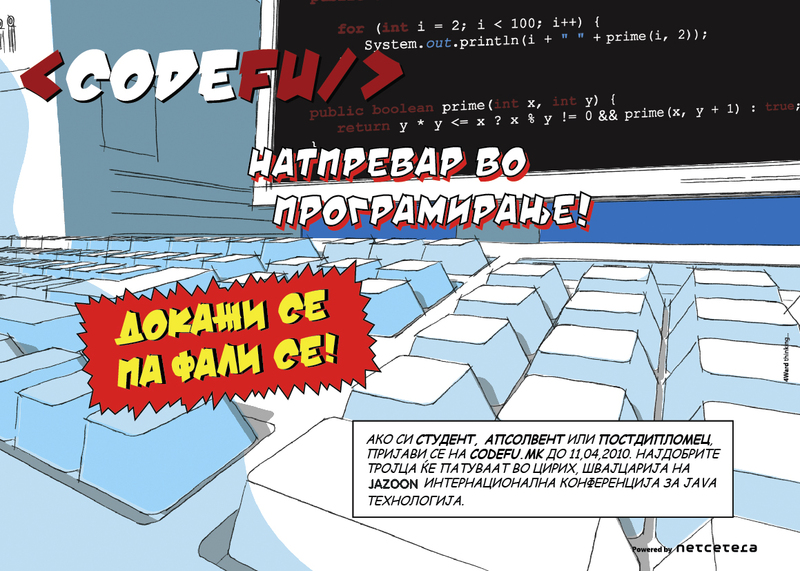 The CodeFu 2010 Final round has finished, the official results are available here. CodeFu Final round problems are available in Practice. If you have spent the last years in the faculty halls chasing signatures, and along the way you studied and programmed. If you feel ready to enter the arena with the best coders in our country, now is the time to show what you know and can do! For this competition you don't need any martial art skills. You need knowledge and wish to prove yourselves! Apply, win and earn your bragging rights. The first qualification round of the competition will be held online on 11th of April 2010. The second qualification round of the competition will be held online on 25th of April 2010. The best three coders will travel to the Java conference Jazoon in Europe, 1st June, Zurich, Switzerland.